Log into your Ancestry account. 1. Click on "DNA" in the top menu bar. 2. Click on "Settings" on the right. 3. Find the panel on the right of the next screen and click on the "export raw data" button. You will then be asked for your password and to agree that they cannot protect the privacy of a downloaded file. They will send you an email. 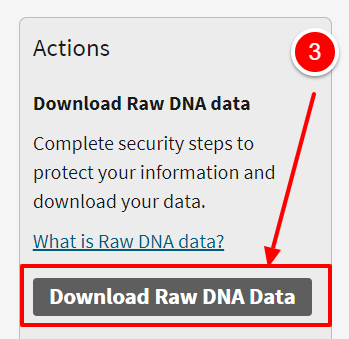 Click on the button to start the download and note the file location. Note this will create a zipped file. Do not unzip it.